Last year, during open access week, the Radical Open Access Collective re-launched with a new website, a directory of academic-led presses and an information platform for OA (book) publishing. We would like to share with you some of ROAC’s highlights for this year. Let us know if we’ve missed something or if there is anything you would like to add to this overview. 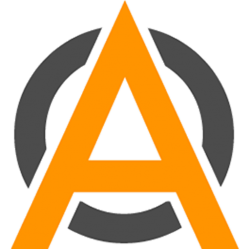 The Radical OA Collective grew its membership substantially: at our launch in October last year we had 25+ members, our community now consists of 54 members, Open Access in Media Studies being the latest to join! We organised a bookstand together with our friends from ScholarLed which was set up at the 2nd Radical OA Conference in Coventry and at Crossroads in Cultural Studies in Shanghai. In Coventry we ran 2 short talks alongside the bookstand, and in Shanghai we organised a round table on OA publishing in Cultural Studies. Looking forward, we hope to continue to welcome new members to the collective and develop our suite of tools to encourage and support others to start their own publishing projects. 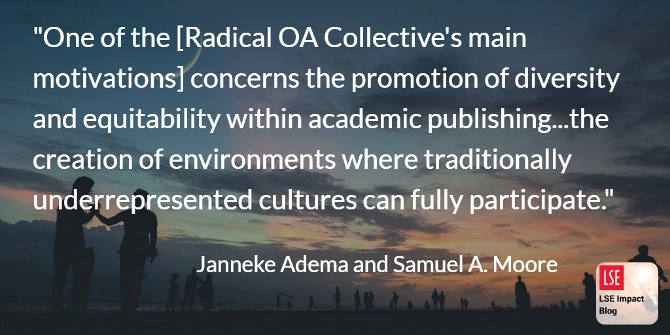 If you run a not-for-profit OA publishing initiative or are interested in starting your own scholar-led publishing project, we encourage you to join the Radical OA mailing list and get involved with the discussion! As a collective, we offer mutual reliance and support for each other’s projects by sharing the knowledge and resources we have acquired. Through our projects we also aim to provide advice, support and encouragement to academics and other not-for-profit entities interested in setting up their own publishing initiatives. Our website contains a Directory of academic-led presses, which showcases the breadth and rich diversity in scholar-led presses currently operating in an international context and across numerous fields, and an Information Portal with links to resources on funding opportunities for open access books, open source publishing tools, guidelines on editing standards, ethical publishing and diversity in publishing, and OA literature useful to not-for-profit publishing endeavours. Underneath a blogpost Samuel Moore and Janneke Adema wrote, which was originally published on the LSE Impact Blog, here. In July, Jisc published its report “Changing publishing ecologies: A landscape study of new university presses and academic-led publishing”. 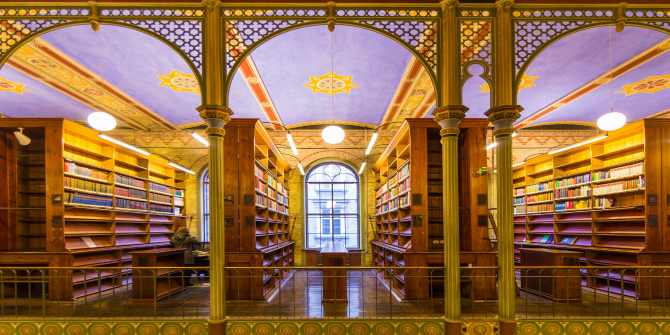 It outlines how, over the last five years, there has been a marked rise in the number of new university presses and library publishing ventures, next to independent presses set up by academics. The report was based on interviews with 14 academic-led presses either in the UK or publishing in the UK market, and a survey of 43 universities, which found 19 new university presses in operation and a further nine planning to launch in the next five years. With our research, we wanted to map this development and outline strategies to support these new publishing structures. As such, we asked the presses in our study about their motivations and publishing ethics, about their business models and copyright and review policies, and, perhaps most importantly, about the struggles they face as presses on a day-to-day basis and what would be needed to improve their situation. Our report concludes with a series of recommendations to help create and maintain a diverse publishing ecology; from supporting community-building and the sharing of information and best practice in this space, to fostering innovation and experimentation by providing tools and services to support the publishing process. Image credit: University library and study hall #2 by Thomas Rousing. This work is licensed under a CC BY 2.0 license. What stands out from our study is how the rise of new publishing models has been mainly motivated by the current publishing landscape, dominated by a handful of large commercial publishing businesses. The presses studied for our report – including universities or libraries setting up their own press (i.e. UCL Press, University of Huddersfield Press, University of Westminster Press, and White Rose University Press), as well as publishing initiatives led by academics or communities of scholars (i.e. Language Science Press, Mattering Press, Open Book Publishers, Open Humanities Press, and punctum books) – all aim, in their own distinct way, to provide an alternative to the existing legacy model and combat the huge profits made within the sector. This motivation chimes with recent calls by academics that research should not only be open but not-for-profit too. As such, the largely not-for-profit initiatives we analysed aim to work for their communities first (as opposed to commercial stakeholders) and provide opportunities to showcase their universities’ or community’s authors. Yet they also want to experiment with different publishing and (open access) business models, and are keen to publish alternative types of content, where more specialised and experimental (digital) works are having a hard time getting published in the increasingly market-driven publishing climate. What these new initiatives have in common is their focus on collaboration, where they don’t see themselves as being in competition with each other. Notwithstanding this focus on collaboration and the sharing of skills and information, many of these initiatives perennially face issues around sustainability (especially if we abide by the industry definition of sustainability which has come to expect profitability in addition to self-sustainability. It could also be argued that academic monograph publishing in the humanities has never been sustainable), and often strongly rely on the labour/investments of a single individual or a handful of people. In the case of many university-led initiatives, sustainability is partly underwritten by the university in the form of a subsidy. However, many institutions still require their presses to operate in a self-sustaining way. For these presses profitability may be viewed in different terms, for example as long-term return on investment via increased research funding (i.e. research grants and QR funding) as an (in)direct consequence of the publication of research. However, university initiatives do face many of the same issues as academic-led publishing. So, what can we do to support these initiatives? If we can’t make them more sustainable, how do we make them more resilient? And, in addition to that, how can we provide budding presses with the resources, tools, and expertise to set up their own publishing programmes? One of our main recommendations focuses on supporting community-building and knowledge exchange amongst new presses. This could take various forms, from collaborative publishing projects and funding applications, to shared marketing to co-promote publications. More formal collaboration, in the form of coalitions, cooperatives, or collectives (e.g. a European Library Publishing Coalition or the Radical Open Access Collective) will also help legitimise these enterprises as publishing models and promote awareness amongst funders and academics looking for a not-for-profit, open-access alternative to publish their next book. The issue of library integration was highlighted as being urgent. Both academic-led and new university presses face significant difficulties in finding their way into existing academic distribution channels for published content. We suggest further work in this area is required and that other bodies in the library supply chain would find it beneficial to join the conversation, together with Jisc, libraries, and the new presses. In order to support the publishing process, there has been a rise in both commercial services, platforms, and projects (such as Ubiquity Press, Glasstree, JSTOR, and MUSE Open), but also new open-source software and publishing platforms set up to support institutional and academic-led publishing. Most recently the press and journal system Janeway (developed by the Birkbeck Centre for Technology and Publishing) has been released. Janeway is designed for open-access publishing and is free to download, use, and modify. But there have also been significant developments in software and platforms focused on experimental publishing, such as the University of Minnesota Press’s Manifold, an open-source platform for iterative publishing. Image credit: Cambridge University Press by Lezan. This work is licensed under a CC BY 2.0 license. Yet many open-source and commercial platforms and tools are unknown to universities and academics interested in setting up a press, or require heavy customisation or significant financial investment. Bringing together more information about these tools and platforms – and developing new ones, where required – and testing them out to establish best practice will be essential. As such, the community professed a need for the development of a toolkit approach that will aid existing new university and academic-led presses, as well as those universities and academics that are thinking of setting up their own publishing initiatives. Such a toolkit will allow presses to adapt specific workflows, tools, and services to their own publishing platforms instead of having to adapt to existing platforms, which are often regulated or structured in a specific way. This toolkit, based on information collated from the communities themselves, could consist of how-to-manuals, best practice guidelines, standardised contracts and agreements, alternative FLOSS software able to support the production process, guidance on how to set up a press, legal advice, and guidelines for preservation and dissemination. This is something Jisc plans to develop in the coming year. We are also interested in the possibility of extending this research to the rest of Europe in order to investigate synergies. For example, there are similarities between many new university presses in the UK and other European countries, such as Germany and the Nordic countries. But, perhaps most importantly, in order to sustain these publishing structures we call upon funders and government agencies to support these new initiatives; from providing existing presses with opportunities to find funding for their publication schemes (similar to how funders already support commercial publishers with APCs, via funding applications that include publishing fees, for example), to supporting academics within or outside institutions in setting up their own presses. 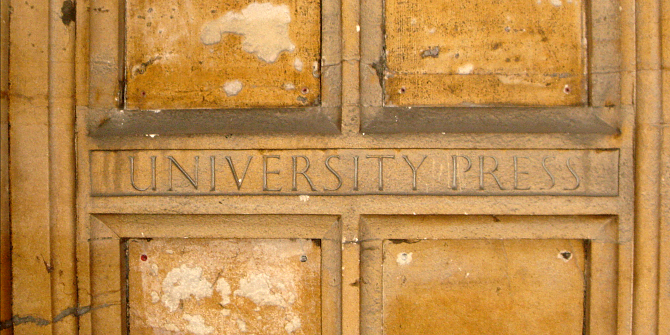 Having academics more involved in publishing as part of their own university presses or community-led scholarly/academic presses – just as many academics currently provide labour to commercial presses through editorships or editorial board service – will be important to support further diversification in the sector. Increased support and recognition for the academics and university and library administrators involved in these kinds of publishing endeavours and/or wanting to set up their own presses will also be essential to progress. By calling for support for these initiatives and by providing them with dedicated tools and software, contracts, platforms, and ways into the all-important library channels, it is our hope that new presses will encourage a diverse ecology that is less focused on profit and more directed by the academic institutions and communities themselves. The full report, “Changing publishing ecologies: A landscape study of new university presses and academic-led publishing”, is available for download from the Jisc repository.